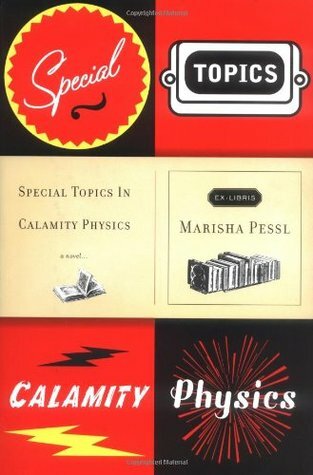 Special Topics in Calamity Physics is a darkly hilarious coming-of-age novel and a richly plotted suspense tale told through the distinctive voice of its heroine, Blue van Meer. After a childhood moving from one academic outpost to another with her father (a man prone to aphorisms and meteoric affairs), Blue is clever, deadpan, and possessed of a vast lexicon of literary, political, philosophical, and scientific knowledge - and is quite the cineaste to boot. In her final year of high school at the elite (and unusual) St. Gallway School in Stockton, North Carolina, Blue falls in with a charismatic group of friends and their captivating teacher, Hannah Schneider. But when the drowning of one of Hannah's friends and the shocking death of Hannah herself lead to a confluence of mysteries, Blue is left to make sense of it all with only her gimlet-eyed instincts and cultural references to guide - or misguide - her. Special Topics in Calamity Physics is one of those books where the writing is as prominent a character as any of the people in the novel. Unlike most of the books I review, Special Topics in Calamity Physics is shelved in the adult fiction section. I think the book will appeal to teens or YA fans who like books that assume the reader is intelligent and isn't afraid to take some chances. Blue is a high school senior whose mother died when she was young and has grown up with her itinerant professor father. She moves constantly so her dad is the only influence in her life. As a result, she's very strange. She's intelligent, unbelievably well-read, and has no idea how to be a normal teenager. Through her actions and narration of the novel, my impression of Blue is someone who wants to fit in but at the same time wants you to know how brilliantly clever she is. It makes her both likable and grating. Similarly Blue's father was a character who I liked and hated. He has isolated Blue from normal life to a point that almost feels abusive. Well intentioned but really damaging. I also disliked how condescending he was. No one, aside from Blue, was good enough. The world is full of stupid, worthless people. And you could see how Blue had absorbed that to a degree. But it was also obvious how much he adored his daughter and I could see how terrified he was of her leaving him to go to college. His efforts to make her senior year special was sweet. The plot reminded me a lot of Donna Tartt's novel The Secret History. Except that it's almost entirely different. Still, it was hard to think of a plot framed around a dynamic teacher and a compelling group of students taken under her wing and not hearken back to The Secret History. The plot unfolded in a standard way until the end. And then it really changed. Marisha Pessl took a big chance in the plot choice and the structure of the ending. I've never read anything like it. I'm not saying much about the plot, because it's somewhat forgettable. It's the writing that makes this book stick out in ways both good and bad. It reminds me a lot of Blue and her father. It's brilliant and fun, but also veers into the smugness territory. It's like Pessl is subconsciously shouting "Look how clever and experimental I am!" For example, Blue is always citing random facts. She references book titles in parentheses as the source of her knowledge. I got a kick out of this, but sometimes it's a bit too much "try." Special Topics in Calamity Physics is what you'd assume from the title. Quirky and intelligent. Sometimes too much for its own good. It is a solid story with fascinating characters, but the writing is what sticks out. It forces you to read slowly and focus on the words themselves even at the expense of the plot. If you want to give your brain a good work out, this is a great way to do it. And a fun read. I have NIGHT FILM by Pessl sitting on my bookshelf, quietly taunting me. I've heard NOTHING but fantastic things about her latest novel, but was always curious to know what SPECIAL TOPICS IN CALAMITY PHYSICS fared like. This is the first review I've read for it, and really enjoyed your thoughts- I'm always up for a good brain workout =). I will definitely be reading this one before NIGHT FILM. I'm always a bit wary when I read the words "darkly hilarious" in a blurb. Usually my sense of humor and what's dark don't quite mesh with either the author or blurb writer and I wind up disliking the book. Not sure this is one for me but it sounds worth a peek. This sounds like a fun book! Good review, Alison! Dark and hilarious makes me cringe in the best possible way! There's something about the quirk of dark humour that really just entices me! "Intelligent" books like this often work for me. But sometimes I do get a a tad annoyed. I hadn't heard of this one yet though. I'm a bit curious, it might be something I'd really enjoy. Not sure this one is my cup of tea but I do have "Night Film" by this author on my tbr. I've heard great things about this one.